'Though my feet are firmly on the ground of Atlantia, I'm dissolving. She decided to go Above. She would never do this. The last thing she said to me was that the city was breathing. I hear my own breathing now, in and out and in and out. I live here. I will die here. Welcome to the underwater city of Atlantia. 'Atlantia does resemble a giant sea creature sprawled out in the ocean. The tentacles of our streets and thoroughfares web out from the larger round hubs of the neighbourhoods and marketplaces. Everything is enclosed, of course. Rio, our protagonist, dreams of glimpsing the Above - of leaving Atlantia. But all her dreams turn to ashes when her twin sister Bay chooses to go Above instead, stranding Rio Below. And so begins Rio's journey to uncover the secrets of the past and discover her future. 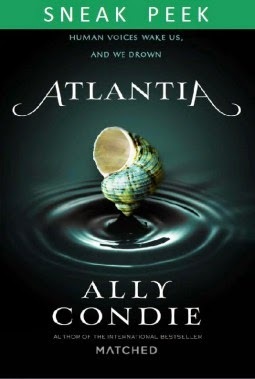 Ally Condie's done it again! I remember that feeling I got when I read Matched for the very first time. I was totally in love with Condie's world and the clever way in which she'd brought that world to readers. Reading this excerpt from Atlantia was the same - if not better. Atlantia holds a level of sophistication I feel Matched lacked. Atlantia's characters are more complex and the storyline grips you right from the start.